Dexter Nardella, DC "I’ve looked for products that support my patients better and there are none." Use the Sit EZ orthopedic wedge seat cushion on your car seat, desk chair, or favorite chair. 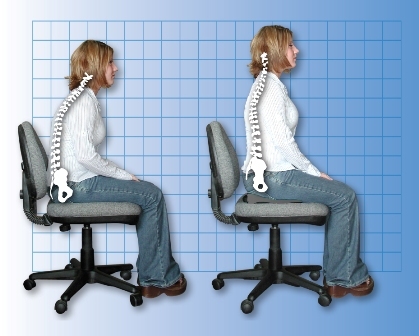 You will feel energized as your body uses less energy to sit. By using this posture seat wedge your neck and shoulders release stress and your back will feel relaxed again. Don't be fooled by cheap foam seats or over-hyped memory foam. As a car seat support wedge, the Sit EZ can’t be equaled. Your body collapses forward when you sit with your hips below your knees. It takes energy for your body to resist this forward lean and to sit up. This is also the cause of pain and tension in your back and neck when sitting. Our car seat support wedge supports your hips at just the right angle to align your upper body and neck with no muscle effort, just mechanics. These wedged orthopedic seat cushions for chairs and cars are made of a dense foam-like material which comfortably changes your sitting angles and gives firm support. You instantly sit up just right. Your muscles stay loose and you don’t get tired or worn out. In your car or favorite chair our posture seat wedge raises and tips your pelvis just right. Your muscles become loose and relaxed. What's more... you'll see the end of stress and fatigue that you get from sitting too long. Made from durable EVA so that it doesn't compress much when you sit on it. This makes it last longer. Click the button below to add the Sit EZ Orthopedic Support Seat to your wish list. I continue to work with Dr. Porter on a maintenance basis and utilize the products he recommends. I use the seat cushions (Sit EZs) in my car, at work and at home. The Sit EZ works so well while I am sitting (keeping me from leaning forward) that I have purchased four of them so I could have one for each car, one for the computer chair, and one for my art studio chair. This seat cushion has really made traveling better and my chair at home much more comfy. I agree 100% with the previous post! It has really helped relieve my low back pain. I take my Sit EZ cushion everywhere. It has made being in the car, long meetings and airplane flights something I can do again without the need for pain meds or being sore after. The cushion has allowed me be able to do so much, I can't say enough good things about it. The Sit EZ cushion goes everywhere I go -- restaurants, driving, flying -- I use it anywhere there are bad seats, and that's just about everywhere!. It puts me into instant good posture. It corrects all the very poorly designed seating options nowadays (chairs, cars, planes), that all seem to throw my beautiful straight spine into a hunched over,distorted, uncomfortable position that makes my neck and lower back HURT. I find myself straining against these seats just to sit straight, and this straining makes me very tired. This cushion is great, I love it!